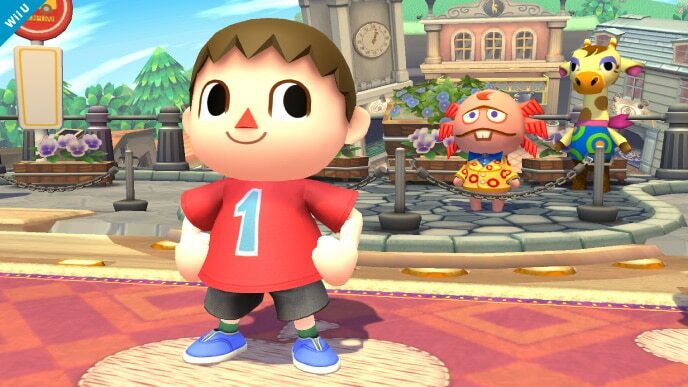 Throughout the history of the amiibo metagame, Villager’s placement has been strange – no one knew what to do with the character for the longest time, and lingered in the amiibo tier list’s bottom rankings. Thankfully, times have changed, and Villager has now shown that he’s worth more than he originally credited with. He has a good jab and a great set of tilts that deal a surprisingly large amount of damage for being so fast, as well as a forward smash that can effectively gimp recovering opponents. 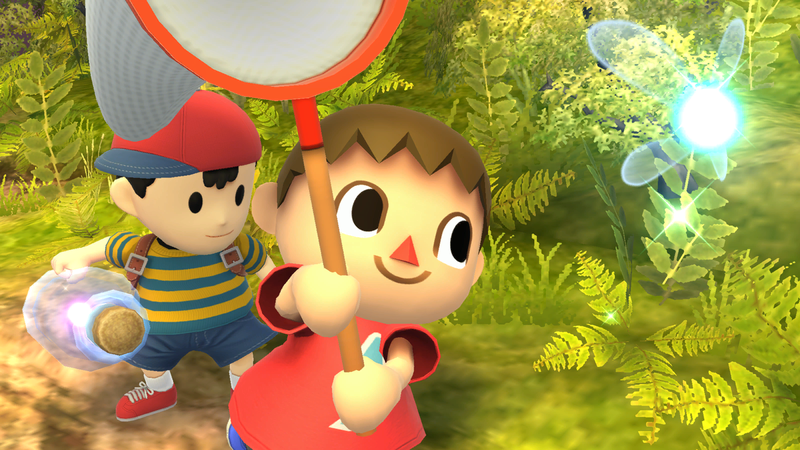 Villager also has access to Lloid Rocket, a useful projectile that can help him maintain a distance from his enemy. Additionally, his recovery is one of (if not the) best in the game due to its distance and versatility. 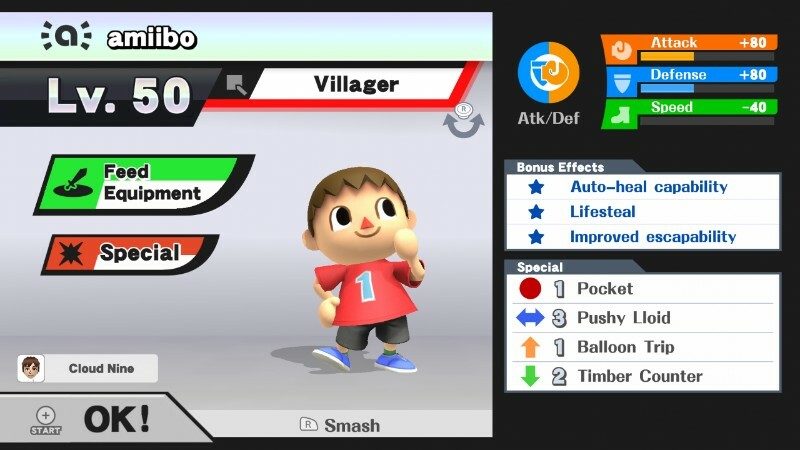 Villager has a promising set of strengths, but he’s unfortunately far from perfect. His AI seems bent on spamming its down smash – this draws him away from his other moves and gets him punished. He also cannot learn to effectively use his down special – he’ll plant the sapling, but fails to follow up by watering it into a tree and then chopping it down. Villager’s range, specifically on his smash attacks, is quite poor – though his smashes are powerful, they often whiff their target and leave him vulnerable in return. 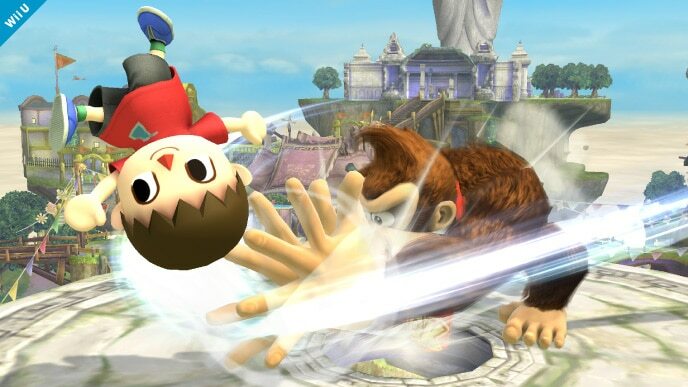 This means that Villager has trouble landing his strongest kill moves. Furthermore, Villager has a slow grab that is difficult to land – if he misses, his opponent will have a great opportunity to strike back. Villager has much unseen potential. If you can iron out the quirks present in his AI, it’s possible for him to be a competent fighter with a somewhat feasible chance of success. Pushy Lloid: This is a custom move version of Villager’s side special. Lloid will be larger and will also strike opponents multiple times, pushing them away before exploding. This custom move isn’t vital to Villager’s success, but it does help him to more easily rack up damage from afar. Timber Counter: This is a custom move version of Villager’s down special, and quite possibly one of the most powerful custom moves in Super Smash Bros. The sprout can trip opponents, and the tree itself inflicts damage to its attackers. As mentioned before, Villager’s AI cannot learn to consistently attack with a four-stage down special – he’ll only plant the sapling, which in this case will trip foes and help your amiibo establish control over the stage. Neutral options: jab, forward tilt, down tilt, Pushy Lloid, and Timber Counter. Villager’s jab is decent, and can be used to great effect multiple times in a row. It can also combo into one of Villager’s tilts. Both his forward tilt and down tilt are fast and strong, and are vital to his success. Pushy Lloid is best used from afar to close the gap between you and your amiibo – it can also be fired off-stage to catch a recovering opponent. During training, you should also try to keep a Timber Counter sapling on the field at all times. Don’t worry about watering it – as long as you plant it every so often, you’re good. Main KO moves: forward smash and up smash. Villager can learn to get exciting KOs with his forward smash off the ledge, so use this edgeguarding technique as your primary KOing strategy. Don’t use it as an on-stage kill move, though – its limited range and slow speed don’t work out very well. Up smash isn’t quite as strong and has a strange hitbox, but with proper spacing, can help Villager pick up a KO in a pinch. Moves to avoid: down smash and grab. Villager’s problem with spamming his down smash can potentially break this amiibo – you’re better off avoiding the move entirely. You should also avoid using Villager’s grab, as its sluggish startup and ending lag leave him horribly vulnerable. Thanks to Blue for compiling Villager’s information. Images are courtesy of SmashWiki and the official Super Smash Bros. website.